Brian H. Cho, MD1, Charles A. Daly, MD2, Sameer Desale, MS2, Oluseyi Aliu, MD, MS1, Aviram Giladi, MD, MS2. 1Johns Hopkins University, Baltimore, MD, USA, 2The Curtis National Hand Center at MedStar Union Memorial Hospital, Baltimore, MD, USA. PURPOSE: Multiple studies have demonstrated limitations in access to specialized trauma care for uninsured patients. Some institutions have sought remedies to these limitations in access, such as adopting the policy of accepting all transfers for specialized trauma care. For instance, the Curtis National Hand Center (CNHC) accepts all transfer requests for hand trauma. However, this policy of universal transfer acceptance has encouraged unnecessary transfers and inappropriate indications for transfer, especially of uninsured patients. In this study, we evaluate if Medicaid expansion under the Affordable Care Act has decreased unnecessary transfers for lower-acuity care by reducing the prospect of uncompensated care provided at local hospitals. METHODS: Using data from the Maryland Upper Extremity Trauma Registry at CNHC, we selected all cases of isolated upper extremity trauma encounters between 2009 and 2016—including 6 years before and 2 years after Medicaid expansion in Maryland (January 1, 2015). First, we used multivariable regression models to evaluate predictors of transfer for upper extremity evaluation. 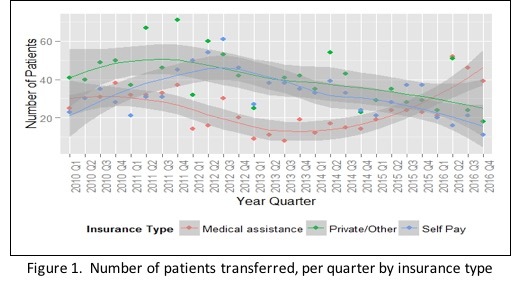 Secondly, controlling for variations in case volume and acuity of injury, we used time-trend analysis to evaluate changes per-quarter in payer status of transferred patients after Medicaid expansion. Lastly, we evaluated changes in the indications for transfers after Medicaid expansion. RESULTS: There were 11,560 upper extremity trauma patients in the registry and 26% were transfers. Results from regression models adjusting for demographics, injury type, and acuity, uninsured status increased odds of being transferred by 35% (OR 1.35, 1.21-1.5, p<0.001). Our models, adjusting for variations over time in overall and transferred trauma volume, showed significant decreases in uninsured patients, largely due to an increase in the number of patients with Medicaid coverage (Figure 1). When looking at all patients within our cohort, we found an increase over time in the proportion of patients without an appropriate indication for referral to a hand trauma center. 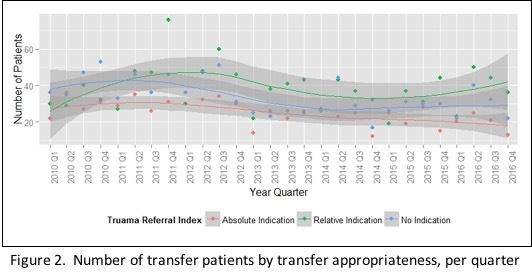 However, of the patients who were transferred after initial evaluation at other institutions, there was a significant increase in the proportion of patients transferred for appropriate indications after Medicaid expansion (Figure 2). CONCLUSIONS: Uninsured status predicts a patient being transferred to a quaternary hand trauma center. With the expansion of Medicaid in Maryland, there was a decrease in the proportion of patients treated for upper extremity trauma without insurance. Additionally, after Medicaid expansion, there was an overall increase in the proportion of transfers for appropriate indications. This finding possibly indicates that transferring facilities increasingly attended to less acute hand trauma as a result of the decreased prospect of uncompensated care after Medicaid expansion.